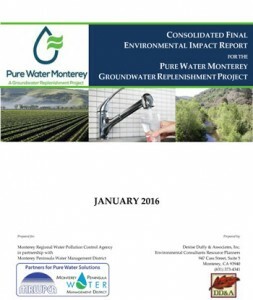 This combined document comprises the Monterey One Water’s Final Consolidated Environmental Impact Report (EIR) for the Pure Water Monterey Groundwater Replenishment Project (SCH No. 2013051094), as well as supporting material from the hearing for the Final EIR and Pure Water Monterey Project approval (October 2015). The Final EIR has been prepared and certified by M1W pursuant to the California Environmental Quality Act (CEQA, California Public Resources Code, Section 21000 et seq. ), and in accordance with the Guidelines for Implementation of CEQA (14 CCR 15000 et seq. ).